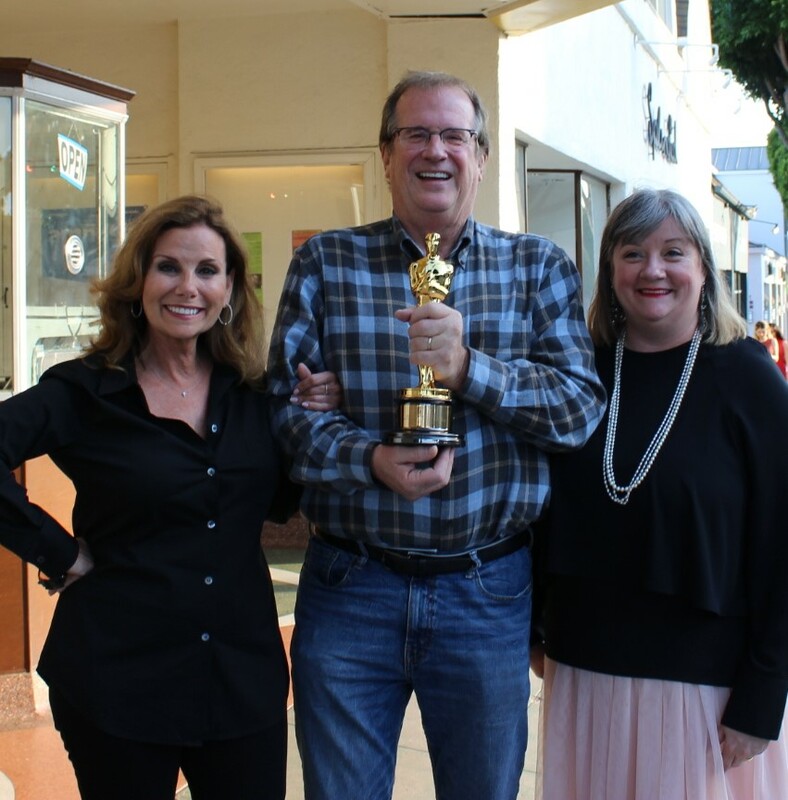 Pete Hammond holds James Coburn’s Oscar for AFFLICTION, flanked by Lynda Erkiletian and Robyn Coburn, outside the Aero Theatre for the screening of that movie in 2017. Photo credit: Allison Gray, Courtesy KCET. Working in production is not the only way to have a great career in entertainment. For people whose talents turn to critical thinking and writing essays rather than screenplays, you can have a fulfilling, successful career as a film journalist or historian. My current interviewee is both. Pete Hammond has a long history of writing film criticism for many major outlets including The New York Times, Los Angeles Times, USA Today, Entertainment Weekly, and New York Magazine, as well as being a presenter on various network news and magazine programs. He has also contributed to numerous books about film including Leonard Maltin’s renowned Movie Guides. I hear he has one of the most intriguing collections of film memorabilia in town. 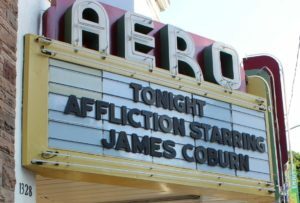 I met Pete as the presenter and curator of the KCET Cinema Series which continues year round at either the Aero Theatre in Santa Monica or cinemas in the Arc Light chain. He attends all the major international film festivals to select interesting high quality first run films for the programs, that KCET audiences often get to see weeks before they open. Then he adds special guests – producers, directors, writers and actors – who come to speak about their projects and take audience questions. In addition Pete inaugurated the Friday evening classic movie series – the KCET Must See Movie, showcasing the stars of Hollywood’s Golden Era of film. These movies make up an essential part of any serious aspiring filmmaker’s sense of history and education in film literacy. On a personal note, I’ve been on that KCET stage as an interviewee talking about the subject of my upcoming biography, my father-in-law actor James Coburn. I can attest that Pete makes you feel completely safe. Not only is he mind-bogglingly knowledgeable, but he is great at asking neat questions and moving the interviews along, and that is a special talent on its own. Pete’s newest critical writings may be found at Deadline Hollywood. What was your very first job in the entertainment industry and how did it come about? I was a page at NBC in Burbank which I got when I had an interview to go into local news there but they felt I didn’t have the experience so sent me to the page program where I gave over 400 tours of the studio and did all sorts of fun stuff for a couple of years. I was determined to be a writer and so after being termed out as a page I got a job writing kids shows for a major producer of that kind of thing in Los Angeles. What was the best advice you were given when you were starting out? If you have the passion you will find a way to get into the business. Don’t give up and don’t get frustrated. What about the worst advice? My college radio/TV professor told me I would never be a professional writer or make it in the business. Turns out he told virtually the same thing to Steven Spielberg a few years earlier. We both went to University of California at Long Beach. What advice would you give to someone starting out who wanted to work in your field? Stick with it. Don’t let me tell you can’t do it.